Edvard Sasun was born Edvard Avagian, in Armenia 1955, into a family of "teachers". He started to draw and paint from an early age but his childhood cannot be recalled without remembering an unhappy occasion that occurred which had a profound effect on his life and growth as an individual. When Edvard was five years of age he fell from a balcony and, as a result, suffered a partial loss of speech, resulting in a period of self isolation. Due to this unhappy incident Edvard became an observer of people and events, spending all of his time focusing on his drawings and studies. Economist - Cybernetics Mathematician. During his time at Yerevan University Edvard held two personal art exhibitions after which professional artists and critics heralded him as a gifted artist of the future. In 1978 Edvard decided to gain a professional education in Art, rather than rely on flattering words, so, at the age of 23, he moved to St Petersburg to join the Repin Institute of Painting, Sculpture and Architecture - the Russian Royal Academy of Art. This move was contrary to the wishes of his parents who expected their son to become a scientist mathematician. Unhappy with his decision to follow his calling of the Arts, for two years his parents denied Sasun any financial assistance in an attempt to draw him back in the direction of science. Undeterred, the young Sasun combined his studies as a free listener at the Repin Institute whilst working as a road sweeper and then as a fireman. After one and half years Sasun reached the required level to allow him to enter the examination for acceptance, notably his mathematical knowledge helped to achieve these results within a relatively short period for a ‘late artist’ and in 1980 Sasun entered the Repin Institute. After two years in the faculty of Graphics strengthening his drawing techniques, Edvard changed to the faculty of Painting where he studied under the guidance of Boris Ugarov, a well known artist, academic and former President of the Academy of Art USSR. It was through his advice that Edvard focused his attention on the great classical artists of Russia and indeed the world. Edvard Sasun with his classmates in the Academy of Fine Arts after Repin. Edvard is sitting in the bottom row, far right. Graduation party at the Repin Academy of Fine Arts. Edvard is sitting second from the left. In 1987 at the age of 32 Edvard qualified as an Artist, Painter and Teacher. His Diploma work titled ‘The Refugees’ (see Compositions genre) caused much concern and disapproval from the committee members due to its subject matter and political interpretation - the Armenian Genocide in Turkey 1915. At the time Boris Ugarov, who was in favour of his students choice said : “Messrs, you know very well that the Armenian Genocide was not only a tragedy of the Armenian Nation, the genocide was a tragedy of the world. It was the victory of evil over good and you now want again to lead a victory of evil over good.....” After these words all the members of the committee agreed that the sketch would be accepted. Sasun began two paintings on this theme, one that was completed in St. Petersburg for his diploma, the other a year later. In both, Sasun successfully depicted the tragedy, but not death itself with his portrayal of a column of deprived worn out people of all ages for whom death seems inevitable. Graduation party with Boris S. Ugarov. Edvard is behind Boris (second from left) with beard and mask. Sasun is a universal artist, diverse in subject and media. He excels in the genres of Landscape, Portrait and Composition whether working in Oils or Watercolours all of which are approached in a serious and responsible manner. Sasun is a lyrical landscapist whose talent captures an inimitable sense of nature. His portraits can be recognized by their distinctive form as he strives to achieve compositional clarity and faultless modelling. In his own words Edvard says of his work “An artist should find within him the subject painted a seed that is alive, dutiful and philosophical. this is what makes the artwork attractive and impressionable, creating an active communication between the spectator and the subject”. 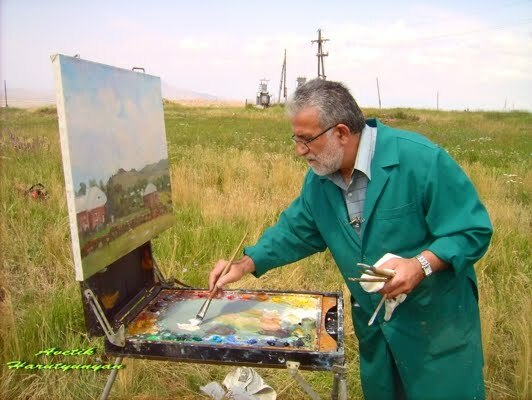 Eventually Edvard returned back to Armenia and in 1988 he exhibited at the Armenian National Gallery. In1997 Edvard settled in Bangkok, Thailand, a place where East meets West and, with the aid of management, for the first time, this became one of his most prolific periods giving Edvard the opportunity of getting in touch with Western influences as well as embracing the Thai culture. Supper", which took ten years in the creation, are all witness of his love and faith in god. Although in time his work has become more complex in form, more refined in colour and freer in execution there is always a deep inner unity between his early and later canvases. This unity is evident in his understanding of the fundamental principles of painting as well as in his attitude to tradition and contemporary reality. Edvard is a painter of consistent development of his painterly idiom which in turn is a continuous enrichment of his life and personality. Edvard is currently residing in Armenian with his family. Edvard Sasun has been recognised by art critics and dignitaries worldwide and now has work in many private collections. The Woodroffe Sasun Collection, which spans 30 years of the history of Edvards' life, is by far the greatest private collection in both size and content.